Demand for fresh water on a pleasure craft has increased dramatically in recent decades. Many of us now expect daily fresh water showers, pressurized plumbing, and unlimited drinking/washing water. Obtaining water on shore from jetties and marinas is becoming difficult and expensive. Having a desalination system provides improved independence and flexibility in your planning. Until now, the only option has been a complicated system built into your boat. The high cost, complexity, and maintenance requirements of built-in desalination systems have been daunting. At Rainman Desalination, we have developed the world’s first simple, low maintenance, and inexpensive marine watermaker that doesn’t need to be installed into your boat. When disaster strikes in small remote areas, entire villages may be found completely isolated, without electricity, and without fresh water. Without preparation, the entire village can be in a dire struggle for life. In survival situations, fresh water is at the top of the priority list after immediate physical danger. Securing a Rainman watermaker is a small investment for communities potentially exposed to cyclones and other natural disasters. If you live in a remote area or go on extended 4WD expeditions, chances are you have been in situations where you only have brackish water. Brackish water will often contain a variety of particulates, bacterias, or tannins. Reverse osmosis is the most thorough way to ensure your water is drinkable. Military units around the world use reverse osmosis as their default filtration system. When space and weight is a premium, they need the smallest and lightest portable system available. 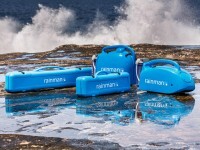 Rainman desalination is the most portable system around.